Eliza R. Snow was the second General President of the Relief Society and served in that capacity 21 years (1868–1887). Called "Zion's Poetess," Eliza is responsible for 10 hymns in the present day LDS hymnal and was one of the most celebrated Mormon women of the nineteenth century. Eliza Roxcy (or Roxey) Snow Smith Young was born in Becket, Berkshire County, Massachusetts, USA on January 21, 1804. She was the second of seven children born to Oliver Snow and Rosetta Pettibone Snow. Her parents moved to Mantua, Ohio, in 1806, where she was educated, and her propensity for poetry showed itself early in life when she began submitting her classroom assignments to her teacher in rhyme. Between 1826 and 1832 she published more than twenty poems in Ohio newspapers using various pen names including Angerona, Narcissa, Tullia, and Ironica. Eliza penned over 500 doctrinal, personal, occasional, and historical poems during her life time. Her suitor, James Barr Walker, whom she ultimately rejected, was part owner of the Western Courier, and their poetry to each other was published in the paper.She became famous and sought after when her poems were published. She was slightly above medium height and of a slender build; her bearing was at one graceful and dignified. Hers was a noble countenance, the forehead being unusually high and expansive and the features of a slightly Hebrew cast, exquisitely cut as those of an artistic specimen of the sculptor’s art. The most striking feature of all [was] those wonderful eyes, deep, penetrating, full of meaning and intelligence, often illumined with poetic fire. They were indeed the windows of a noble soul. Her conversation was charming, every word being distinctly articulated. … In speech and action she was thoughtful and deliberate. Joseph Smith, Jr. visited the Snow home in 1831 and baptized Eliza's mother and sister, Leonora, that year. Eliza, however, was not as hasty to join the fledgling Church. After much deliberation, Eliza was baptized on April 5, 1835, and moved to Kirtland, Ohio, in December to be with the saints. In Kirtland, Eliza lived with Joseph and Emma Hale Smith working as their family school teacher. She also composed two hymns for Emma's new hymnal. Eliza again moved with her family to Missouri in June 1836. The family had been there only nine months when persecution drove the family to Illinois. Eliza was named "Zion's Poetess" by Joseph Smith, Jr., and was a frequent contributor to Nauvoo publications. She again lived in the Smith household as a teacher from August 1842 to February 1843. Initially repelled by polygamy, Eliza came to esteem it as a divine principle. 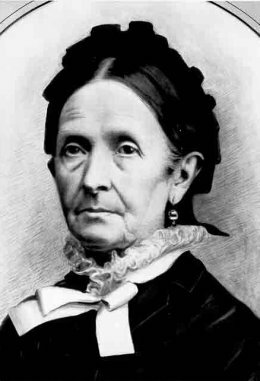 She was a plural wife of Joseph Smith, Jr. (June 29, 1842), and after his death on June 27, 1844, became the wife of Brigham Young (October 3, 1844). Eliza remained childless throughout her life. Present at it's first meeting on March 17, 1842, Eliza was selected as first secretary of the Relief Society, and suggested the name finally settled on by the debating group: The Female Relief Society of Nauvoo. As secretary, she kept the minutes. Departing Nauvoo on March 4, 1846, she carried the records of those meetings with her on the long journey west with the Saints, arriving in Salt Lake City, Utah, safely on October 2, 1847. She was part of the company that arrived just months after the first company, and she witnessed the growth in the valley. In 1866, Brigham Young asked her to help re-organize the Relief Society. During the first winter in the Salt Lake Valley, Eliza lived in a log room with Clara Decker Young, a wife of Brigham Young. She later lived with her second husband, Brigham, and several of his other wives in the Lion House. Eliza was a magnet for intellectual and spiritual women alike, and many conversations relating to suffrage or other women's issues were held in her room there. When Eliza was 68, she traveled with a delegation of Saints to Europe and to the Holy Land. Many of her Relief Society sisters helped fund her travels, so she shared her experience with her sisters by writing poems describing her journey and sending them back to be printed in Woman’s Exponent magazine. Eliza's brother Lorenzo Snow became fifth prophet of the Church. Eliza was instrumental in the organization of the Retrenchment Association for Young Ladies and Primary Association in addition to her work with the Relief Society. As general president of the Relief Society, she was the de facto general Primary president. She traveled throughout the Latter–day Saint communities of the American West, encouraging the organization of local Primaries and instructing new presidencies. She also directed ordinance work in the Endowment House after it was dedicated in 1855. The last journey of her life was to southern Utah to meet with Relief Societies and Primaries. She loved to allow the Primary children to hold in their hands the watch she had received from Joseph Smith. Eliza was called by Brigham Young to help bishops reorganize Female Relief Societies in 1866. She traveled all over Utah encouraging sisters to join societies "not only for the good of the poor, but for the accomplishment of every good and noble work." (History of Relief Society, page 30) In her new role, Eliza traveled with her counselors, Zina D. H. Young and Elizabeth Ann Whitney, to Mormon settlements in nearly every type of conveyance imaginable, enduring nearly every type of weather. Due to the efforts of Eliza's presidency, there were Female Relief Societies in the twenty Salt Lake City wards, in nearly every county in Utah, and several other nearby communities by the end of 1868. These newly organized branches of the Relief Society met twice each month. During one of these monthly meetings, they sewed and cared for the needs of the poor, and at the other they received instruction on a variety of educational or inspirational themes. At first, sisters met in private homes, but eventually most groups built halls of their own in cooperation with the brethren. In 1876, after failing to secure space at the United States Centennial Exhibit in Philadelphia, Pennsylvania, Eliza and others organized a Women's Centennial Fair in Salt Lake City, Utah, to exhibit Mormon women's artistic and utilitarian handiwork. After the successful Fair, Relief Society opened a store to sell home manufactured articles with Eliza R. Snow acting as manager. This new store was called the Women's Commission House. Among the items sold were beautiful laces, hats, shawls, stockings, stockings, dairy products, and soap. Due to rapid growth of Church auxiliaries, President John Taylor organized executive committees to head the Relief Society, Young Ladies' Mutual Improvement Association, and the Primary Association. Eliza was nominated by President Taylor to be President of the Relief Society Of the Church Of Jesus Christ in all the world in 1880. In July 1880, the Church celebrated its Jubilee year with a great procession. Eliza joined the other Relief Society leaders in one of three horse-drawn carriages participating in the festivities. An elegant homemade silk banner proclaimed that the Relief Society now numbered 300 branches. After many years of effort, Deseret Hospital was finally established by the Relief Society in 1882. Deseret Hospital served the people of Utah for 12 years as a hospital and school where classes in health and hygiene were given. Eliza served as a president of the hospital in 1881. Among the programs instituted by the Relief Society during Eliza's tenure were the grain-saving program, sericulture (silk production), and a special emphasis was placed on hygiene and nursing. Also during this time, women published their literary productions in the Women's Exponent. Relief Society news and national political updates, often related to women's suffrage, were also included in the semimonthly publication. Hymn 17 - "Awake, Ye Saints of God, Awake!" Hymn 77 - "Great Is the Lord"
Hymn 122 - "Though Deepening Trials"
Hymn 186 - "Again We Meet around the Board"
Hymn 191 - "Behold the Great Redeemer Die"
Hymn 195 - "How Great the Wisdom and the Love"
Hymn 266 - "The Time Is Far Spent"
Hymn 273 - "Truth Reflects upon Our Senses"
Hymn 292 - "O My Father"
Hymn 307 - "In Our Lovely Deseret"
This poem is one of Eliza's most well-known works. Among other expansive ideas, it describes briefly the logical way she came to an understanding that Heavenly Father must also have a wife. Eliza wrote two books of poetry for publication titled Poems, Religious, Historical, and Political that were published in two volumes. She assisted in the founding of a literary society and was president of Deseret Hospital. "What is the object of the Female Relief Society? I would reply—to do good—to bring into requisition every capacity we possess for doing good, not only in relieving the poor but in saving souls. United effort will accomplish incalculably more than can be accomplished by the most effective individual energies" ("Female Relief Society," Deseret Evening News, Apr. 18, 1868, page 2). Derr, Jill Mulvay. "Encyclopedia of LDS History: Snow, Eliza R."
The Relief Society General Board Association. History of Relief Society 1842-1966 1967, page 12. Mormon Literature Database: Eliza Roxcy Snow. This page was last edited on 19 April 2016, at 22:14.